This part of the state has many contrasts. Part of the region is dry, high plains. Much of it has been turned into crop fields with the help of available water. This is the area the pioneers came through on the Oregon Trail. 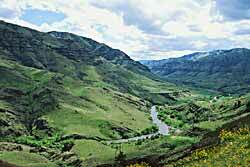 The Wallowa Mountain part of the region is lush and green. Outdoor recreation abounds in this region.